During my ‘working life’ I’ve had many different lunchtime eating habits, ranging from a diet coke and packet of crisps when I first started work, to eating a full meal at lunch time so that I had all evening to do whatever I liked, then onto pub or bar lunches most days on expenses, later grabbing something on the go because I was going to the gym or working through to buying a sandwich or salad to take back as I spent the lunch hour with The Hubs. Since coming back to work after my maternity leave – a year on 6 June(!) 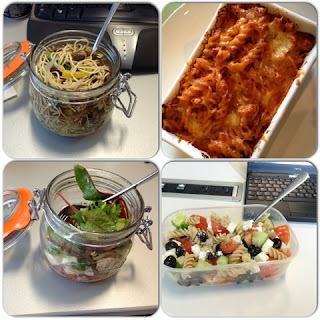 I have been really trying to make our lunches, The Hubs is very easy to please and a wrap, some breakfast bars and a drink is all he needs to keep him satisfied during the day, with the odd pasta or salad thrown in now and then to relieve the boredom! I, on the other hand am very fussy when it comes to lunches, I don’t like homemade ‘sweaty’ sandwiches or wraps. I love jacket potatoes and pasta dishes and much prefer to eat a larger meal at lunchtime and just grab a snack for my dinner in the evening. On the days that The Hubs doesn’t come home until late, I have started to eat a full meal at lunch which means that it gives me more time in the evening. The Hubs and I are currently trying to lose a little bit of weight, although we are both our ideal BMI we do feel that we could do with losing a few pounds, he is now going to the gym at lunchtimes and I’m using my lunches to work on business products, the blog or catch up with on demand TV, this means that I need lunches that are quick and easy and as I’m trying to lose weight and gain more energy they need to be healthy. A pasta greek salad, just a greek salad with an extra bit of pasta in to bulk it out! Mozzarella salad for days where I need something a little lighter I was inspired by mason jar salads that I saw on Pinterest and when I tried one, it was very successful. When I have tried more variations and have more experience in the area I plan write a full blog post to share my experience. Other lunches I’ve mixed in so far are Jacket Potatoes, quiches and soups. I'm hoping to have a go-to list of 10-12 lovely lunches that I can rotate, I also would like to experiment more with seasonal ingredients and use produce from the garden so they need to be adaptable.